Pocket litter is a term used by living history enthousiasts. It compiles both restorable original items and reproductions. This category is not meant for the collector of original artifacts but purely for the reenactor striving for period correct personal items, reproductions or restorable pieces. The ultimate collection of Pocket Litter. 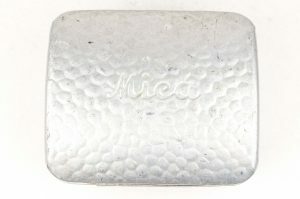 This “Mica Wirtschaftkasten” was one of the most luxuous pieces of private purchase pocket litter. This set was commonly gifted to sons going to war, bought by officers or bought at barracks stores. 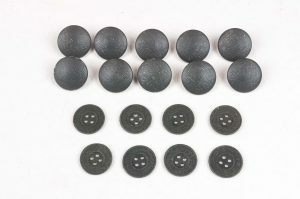 This kit basicly had all the items a soldier would need to keep clean and organised. The Mica comes with a basic set of period personal items and was designed to fit inside the M31 messkit. A nice small private purchase torch in good working condition. The more luxurious version of the green Knijpkat. Made by Philips in Vucht. A nice small torch in a period handmade pouch! A nice and usable 5 liter Trinkwasser water carrier. These carriers where first introduced around 1941 probably due to the hot climate in Italy and Africa. These are becoming hard to find and are a good and secure way to take drinking water to the front. This one still has most of its original paint and stencils and is in very good condition! The canister is clean. 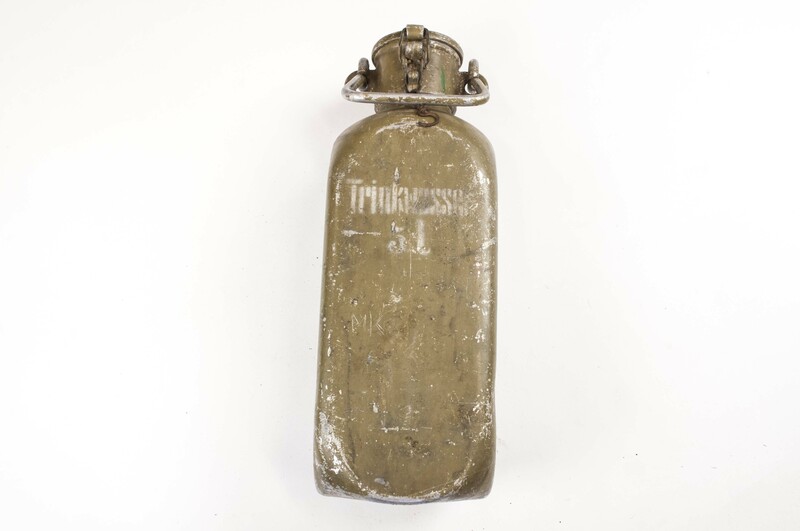 It has not been used to store oil, gasoline or other poisonous substances. I have drunk water from this one myself last summer. 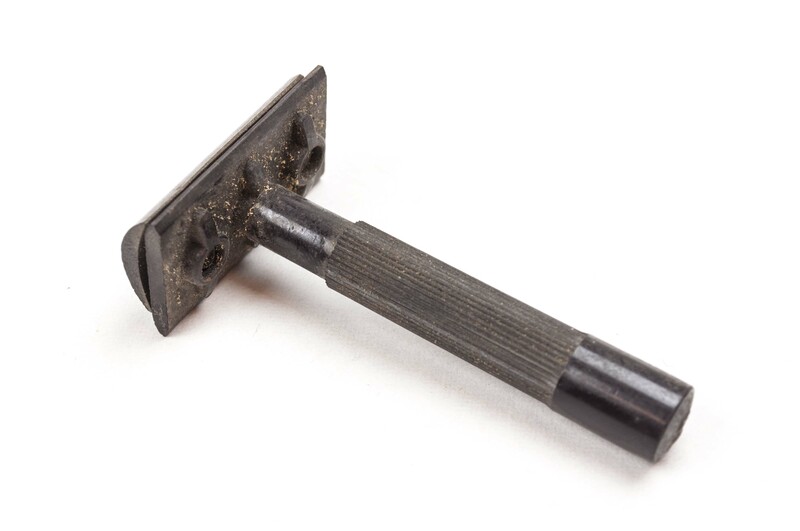 A nice and usable period Bakelite razor made in France. This unscrews and works perfectly and would be perfect for living history! A beautiful pre war French pocket knife. 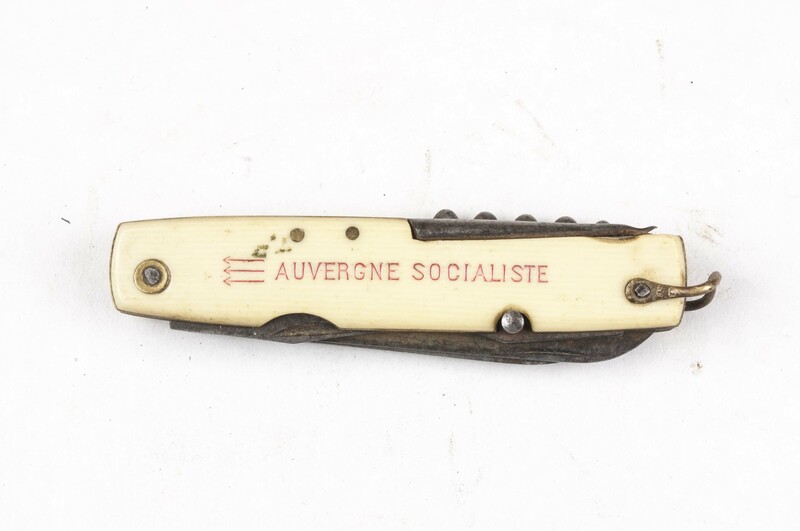 This knife has a lot of small fold out accessories and is marked “AUVERGNE SOCIALISTE” which was a French Socialist movement in the Auvergne region between 1930 and 1940. This knife is big and heavy. The sides have been lined with bone and it shows signs that it wasn’t a cheap knife at the time, either. This is the nicest pocket knife I’ve had to offer, ever. Original period toothbrushes. One of the best known characteristics of wartime toothbrushes is the fact that the “brush” part is very long. The toothbrushes are made out of wood. I would consider using one like this as it is as new. Toothbrushes weren’t a issue item, they where private purchase. A civilian toothbrush like this is is what the German soldier would have.